For an ergonomic change of grip position on the bike. Who doesn't know the desire to change the grip position during longer rides on the bike. Just relax your hands, move them to a different position and that without an unfavourable bending of the wrists. 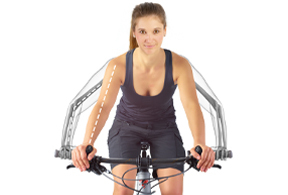 The Innerbarends® do this with an additional aerodynamic elbow position, which is close to the body. The Innerbarends® have no fixed range of use, so they are suitable for mountain biking, trekking and city biking.